The term Efficient Market Hypothesis is applied to markets that are "informationally efficient". In other words, buyers and sellers in any market have all the information needed to agree a price. On the surface this means that one cannot consistently achieve profits in excess of the average market returns given the information publicly available at the time the investment is made. If that is the case, can we make any money in sports betting markets? Obviously, some people do and some don't. Remarkable as it may seem, the betting public collectively knows the true outcome of a sporting event through their betting actions. The money going on the protagonists in a sporting event causes backers and layers to alter their prices. Odds shorten on the fancied competitors and lengthen on the least fancied. Prices eventually settle at values that reflect the true probability of winning. The movement of prices is known as price discovery. When prices have settled at their correct values we say that the prices were chosen by the wisdom of the crowd, whereby the crowd of bettors collectively know the outcome of a sports event even though any single bettor is uncertain of the outcome. Information enters the market via previous performance data and the media (form or handicap analysts, tipsters etc.) which is then digested by bettors and made manifest by their betting actions. The more bettors that believe a certain horse will win then the more money will go on that horse and the shorter its odds will be. Take, for example, a typical horse race, displayed on Betfair. 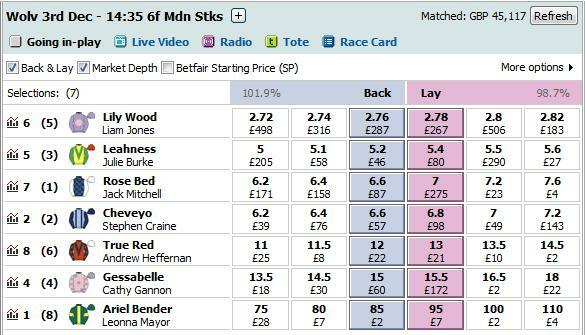 Here we see a race with the favourite (Lily Wood) at a price to back of 2.76. As we know, a decimal odds value can be converted into a percentage by taking its reciprocal. If you were to take all horses starting a race at 2.76 then you would find their win rate was pretty close to 36%. This demonstrates the wisdom of the crowd of bettors. Paradoxically, the odds are not actually true in themselves. A horse going off at 2.76 may or may not have odds of 2.76, it's just that in the long run, all horses priced at 2.76 will win approximately 36.2% of races. There maybe short runs where more than 36% of horses win or considerably less. This is where you enter the scene to discern the true odds from the race odds but it is never a simple task. In the following graph we can see a comparison of the market perceived chance of horses priced (this time by bookmakers and not Betfair) from evens (2.0 decimal) to 11-1 (decimal 12) for over 45,000 runners during two seasons of racing during the 1990s. Note how closely the two lines match each other. 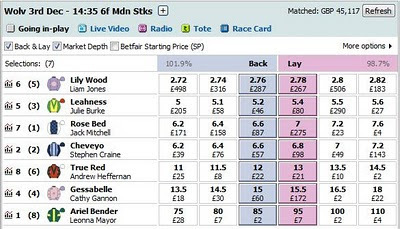 The gap being the two lines is the bookmaker's overround. 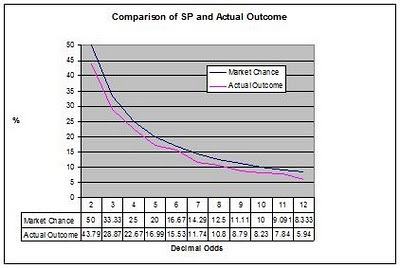 A similar graph using Betfair SP would show the lines much closer together thus demonstrating the fairer odds (smaller overround) offered by Betfair. Assuming markets are never overround (the Betfair example is slightly overround by 1.9%) then betting on all horses at odds 2.76 will result in only getting your money back minus commission. In the example above, if you were to bet on all horses at odds 2.76 with an overround of 1.9% then you will lose 1.9% of your wealth over time. The beauty of Betfair is that a book tends towards 100% most times thus presenting the fairest prices in the market. Indeed a market on Betfair can be underround (total market less than 100%) and offer a suitably equipped arbitrageur with a fleeting chance of instant profit. Studies show that horse race betting markets are somewhat efficient in that all information about the event is represented in the prices.